This is a collection of precisely quantitated bacterial transcription and translation initiation elements. The kit contains combinations of specific constitutive bacterial promoters that vary in strength, followed by a specific Bi-Cistronic Design element that also varies in effectiveness. These different, unique combinations can be used to reliably drive expression of a gene of interest in E. coli in a controlled, reliable manner. This kit consists of one 96-well plate, and will be shipped as bacterial glycerol stocks on dry ice. Samples should be frozen at -80°C immediately upon arrival. Please note that plasmids in wells A1-C10 (pFAB3905-pFAB3893) are shipped as glycerol stocks in strain BW25113. Plasmids in wells C11-E1 (pFAB801-pFAB1935) are shipped as glycerol stocks in strain DH10B. This set of plasmids is described in the following article. Please refer to Supplemental Figure 25 of Mutalik et al, 2013 for quantitated absolute expression values for promoter-BCD combinations. Precise and reliable gene expression via standard transcription and translation initiation elements. Mutalik VK, Guimaraes JC, Cambray G, Lam C, Christoffersen MJ, Mai QA, Tran AB, Paull M, Keasling JD, Arkin AP, Endy D. Nat Methods., DOI : 10.1038/nmeth.2404 Publication Date: 2013 April. PubMed PMID 23474465. Measurement and modeling of intrinsic transcription terminators. Guillaume C, Guimaraes JC, Mutalik VK, Lam C, Mai QA, Thimmaiah T, Carothers JM, Arkin AP, Endy D. Nucleic acids research 41 (9), 5139-5148, DOI : 10.1093/nar/gkt163 Publication Date: 2013 March. PubMed PMID 23511967. This is a collection of precisely quantitated bacterial transcription and translation initiation elements. The kit contains combinations of specific constitutive bacterial promoters that vary in strength, followed by a specific Bi-Cistronic Design (BCD) element that also varies in effectiveness. These different, unique combinations can be used to reliably drive expression of a gene of interest (GOI) in E coli in a controlled, reliable manner. The BCD element is designed to enhance expression of your GOI by coding a leader peptide that overlays by a single base with the start codon of the GOI. This overlap ensures that no secondary structures interfere with the expression of your GOI. Also included are highly efficient several different bacterial transcription terminator elements, which ensure that only the coding sequence of GOI is transcribed. The promoter-BCD combination plus your GOI followed by a terminator element is referred to as an Expression Operating Unit (EOU). For more information see the associated publications. 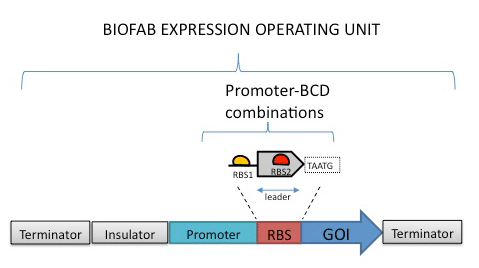 The promoter, BCD and terminator parts in the BIOFAB kit do not have restriction enzyme sites on either upstream or downstream side of each part. The individual genetic parts from these plasmids can be amplified by doing PCR and cloned into desired backbone using type IIs endonuclease (Golden Gate assembly) method. The primers needed to amplify the parts from BIOFAB plasmids and assembly of combinatorial constructs can be designed by using software tool such as J5 (click here for detailed notes and protocols). Additional information on the BIOFAB collection and components can be found at the www.biofab.org. These plasmids were created by your colleagues. Please acknowledge the Principal Investigator, cite the articles in which they were created, and include Addgene in the Materials and Methods of your future publications. "The BIOFAB plasmids were a gift from Drew Endy (Addgene kit # 1000000037)"